The global 2,5-furandicarboxylic acid market was valued at around US$ 300.0 Mn in 2016 and is anticipated to expand at a CAGR of over 8.2% from 2017 to 2025, according to a new report published by Transparency Market Research (TMR) titled ‘2,5-Furandicarboxylic Acid (FDCA) – Global Industry Analysis, Size, Share, Growth, Trends, and Forecast, 2017–2025.’ Expansion of the global 2,5-furandicarboxylic acid market is driven by rise in demand from the carbonated soft drink industry and legislative support. The 2,5-furandicarboxylic acid market in Asia Pacific is expected to expand at a CAGR of over 9.0% during the forecast period. Favorable government regulations, development and expansion of new plants by global manufacturers, and increased demand for biobased packaging are likely to propel the 2,5-furandicarboxylic acid market in the region. 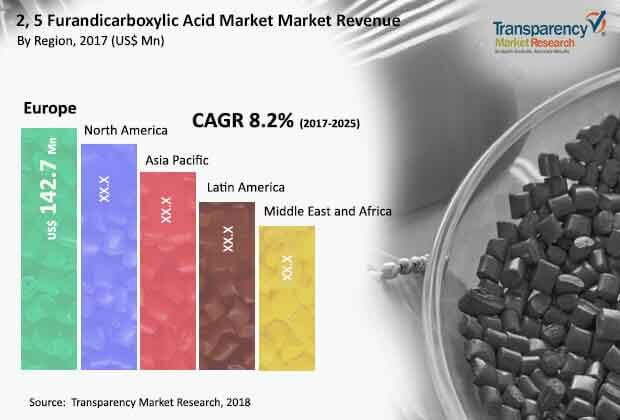 Increasing awareness about environmental problems and severe regulations against plastic usage and carbon emissions are anticipated to propel the 2,5-furandicarboxylic acid market. Changing lifestyles and rise in demand for bio-based packaging among consumers are expected to significantly boost the market. Technological advancements and rise in investments in research and development of biobased chemicals and materials are projected to be expansion opportunities for the 2,5-furandicarboxylic acid market. However, high cost compared to conventional polymers is likely to hamper the 2,5-furandicarboxylic acid market. In terms of application, the 2,5-furandicarboxylic acid market can be divided into polyesters, polyamides, polycarbonates, plasticizers, and others. The polyesters segment is anticipated to dominate the market during the forecast period. 2,5-furandicarboxylic acid replaces terephthalic acid and by using renewable EG, a 100% renewable polyester. The polyester has polymers’ characteristics of biodegradability and biocompatibility, which increases the market demand. Governments across the world are encouraging the usage of biobased products, which is increasing demand for 2,5-furandicarboxylic acid from the packaging industry. Imposition of government norms against carbon emissions and plastic usage is responsible for the rise in demand for 2,5-furandicarboxylic acid based products. Increase in awareness regarding environmental issues is a key driver for the 2,5-furandicarboxylic acid market, applicable to beverage industry. Increase in the rate of urbanization across various regions around the world is an essential expansion indicator for the 2,5-furandicarboxylic acid market. In terms of region, the global 2,5-furandicarboxylic acid market can be categorized into North America, Europe, Asia Pacific, Latin America, and Middle East & Africa. Europe holds a prominent share of the 2,5-furandicarboxylic acid market, owing to the green procurement policies followed by the European Union. North America also constitutes a significant share of the market. The market in Asia Pacific is estimated to expand at a rapid pace due to rapid industrialization and changing lifestyles in developing economies such as China and India. The market in Middle East & Africa and Latin American is expected to expand at a rapid pace during the forecast period. Key players operating in the 2,5-furandicarboxylic acid market are Avantium Holding BV, Corbion NV , Toronto Research Chemicals Inc, Alfa Aesar GmbH & Co KG, Synvina, Asta Tech Inc, Novamont SpA, Chemsky (Shanghai) International Company Limited, AVALON Industries AG, and V & V Pharma Industries. Companies are focusing on new product development and expansion strategies. For instance, Novamont SpA manufactures bioplastics and biochemicals through the integration of chemistry and agriculture. It also manufactures Celus-Bi, a new line of innovative and biobased ingredients for the cosmetics sector that has applications in personal and household products. Furthermore, the company has invested US$123.21 Mn to convert an abandoned plant near Rovigo in Italy's Po River delta to start industrial production of the chemical compound bio-butanediol.